Want to know about the black guinea pig? We have all the information for you. Read on if you want to know more about this cute critter! Guinea pigs are incredibly popular pets, and they are becoming an increasingly common sight in homes around the world. They are sociable, intelligent, and relatively easy to take care of. If you’re looking to bring a guinea pig into your home, particularly a black guinea pig, you’ve come to the right place! 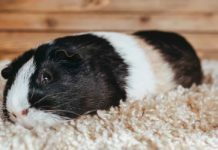 If you’re looking for a black guinea pig, there are a few different breeds you should consider. The American guinea pig is one of, if not the most, common of the guinea pig breeds. It is also the oldest. There are records of the American guinea pig being bred and domesticated as far back as 5000 B.C., in the Western part of the Andes Mountains in South America. European traders brought them back from their voyages to the New World in the 14th and 15th century. Their popularity has only grown from there! Today, they are found in pet shops around the world, and are the most prevalent breed due to their long history of being domesticated. They have a short, smooth coat that sticks close to their body and can be either one solid color (called a Self coat) or patterned. ASelf black guinea pig is hard to find, but they’re more common in the American breed than most others. However, you won’t find a long-haired black guinea pig in this breed. The Abyssinian is another one of the oldest formally recognized guinea pig breeds. It is commonly thought that the name “Abyssinian” comes from the ancient Abyssinian region in what is now Ethiopia. While they may have been named for the region for some reason, there have never been wild guinea pigs in the area. No records go back far enough to really tell us where the name originated. What we do know is that long-haired guinea pigs first showed up in Europe about the same time as short-haired ones in the 15th century or so. Since then, Abyssinians have been one of the more popular guinea pig breeds. They have long hair that includes “rosettes,” which are cowlick-lick hair patterns that spiral out from a center point in the coat. This gives them a fun and interesting coat, but the length of their hair means that grooming is of paramount importance. If you’re looking for a black long haired guinea pig, a black Abyssinian guinea pig is a good place to start your search. The Peruvian guinea pig, as you probably guessed, originates in South America, particularly Peru, but also Bolivia and Argentina. Peruvians are an old breed. They were first brought to Europe in the late 19th century, and from there made their way to America, where they was formally recognized as a breed. The standout characteristic of the Peruvian guinea pig is its coat. The Peruvian guinea pig’s top coat can grow to as much as 24 inches in length, while its undercoat stays a little over six inches in length. This can be difficult to keep clean and well groomed. So, it is strongly recommended that you keep your Peruvian’s coat trimmed short and neat. That way, it doesn’t mat or collect dirt and other debris, unless you plan to show the guinea pig in competition. If you do decide to enter your Peruvian in competition, it’s important to note that it will need daily, if not twice-daily grooming care, to insure it stays both clean and comfortablewith its extraordinarily long fur. If you’re looking for a long haired black Peruvian guinea pig, you may have to search for quite a while. Peruvians are most commonly found in bi or tri-colors composed of white and gray mixes. But black or black roan guinea pigs can be found in this breed. 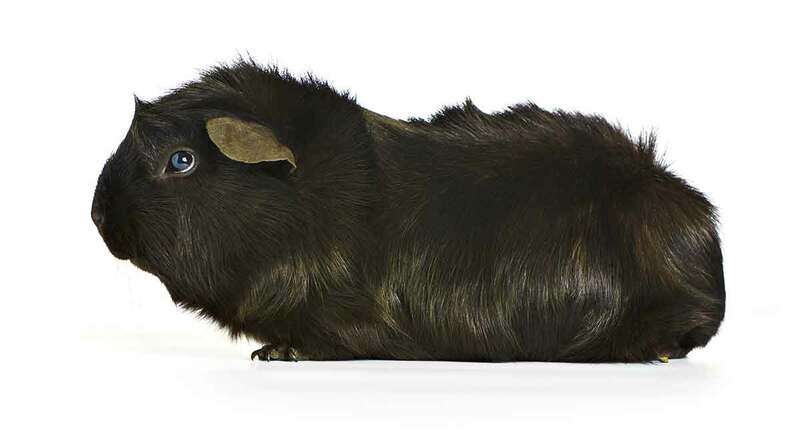 Roan guinea pigs are black, with white hairs dispersed through their coat. The teddy guinea pig is somewhat unusual among guinea pigs in that it has a short, rough coat that curls, almost like that of the first teddy bears. Hence the name! This coat was a breeding choice, and it serves to distinguish the teddy from all other guinea pig breeds. Teddy guinea pigs are becoming more and more common as they interbreed with American guinea pigs. You may even find them in retail stores. This makes them a great option if you’re looking for a black guinea pig that is a little bit different from the norm. The Texel guinea pig is actually a sub-breed of guinea pig that has only recently been recognized as a distinct breed, but it is worth mentioning because of the breed’s trademark long and curly coat. Unlike other breeds such as the Teddy guinea pig, the Texel has long, curly fur, almost like the Peruvian, except it hangs in beautiful ringlets. There are black Texel guinea pigs, but be forewarned: if you’re looking for one, you may have to call around to breeders. You’re unlikely to find one in your local pet store. If you’ve decided on a black guinea pig as a pet, there are a few things you need to know. Like all guinea pigs, black guinea pigs are hardy and easy to care for. They can live 4-8 years. But there are still some things to keep in mind with their diet and long term health. 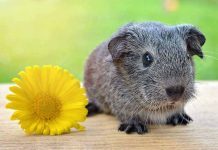 First, while generally not very susceptible to disease, older guinea pigs can develop certain problems if they’re lacking in certain nutrients such as Vitamin C. Black guinea pigs aren’t immune to these issues. Vitamin C supplements are crucial to the health and well-being of your black guinea pig because they can’t manufacture it on their own. Vitamin C-rich fruits and veggies are insufficient. Without supplements, your guinea pig may develop issues such as scurvy, or arthritis, particularly in their knees. Guinea pigs are prey animals, and as such they have instincts that tell them to hide signs of illness or injury. In the wild, they would be more likely targets for predators if they looked sick or hurt. Unfortunately, this instinct that serves them well in the wild makes it difficult for Guinea pig owners to spot some health problems. This means it’s important to monitor your black Guinea pig’s health and diet carefully. Guinea pigs,require a sturdy cage with a solid bottom, and plenty of things to tunnel into or underneath. They will also require a water bottle, and a heavy food bowl that isn’t prone to tipping or spilling. Many guinea pigs will put their front paws in or on their food bowls, which can cause a light bowl to flip over or tip. In the wild, guinea pigs graze on vegetation such as leaves, stems, seeds, and grasses. As pets, fresh green grass, hay, ripe fruits, and vegetables are the mainstays of their diet. While there are guinea pig pellet food options available, these should only be used as a short-term option for when you can’t get to the store. They should not be a staple of your guinea pig’s diet. Honeyed oats, mixed with a bit of water to create a mash, are also an excellent option, especially if you’re looking for a dry food you can keep on hand at all times. You can also build a small hutch or run for your guinea pig to use outside. Provided it doesn’t have a bottom, your guinea pig can graze on grass as much as it likes. Be careful of pesticides and other chemicals on the grass, however. Also, make sure you check your guinea pig for fleas and mites regularly if they go outside or share a home with animals that do. Longer haired guinea pigs will need careful grooming and attention as they may develop matted fur and tangles. They will also be harder to treat for mites and fleas, as well as other skin problems. For this reason, if you’re looking for a lower-maintenance guinea pig, a short-haired breed is recommended. When selecting a black baby guinea pig, it’s important that you choose one that appears healthy. A healthy baby black guinea pig will have bright and clear eyes. Its nose, ears, and bottom should also be clean and free of signs of sores or discharge. You should also examine the skin on the back, neck, or stomach for signs of fleas, sores, redness, or flaking skin. Fleas can be treated with powders, but irritated skin or sores can be a sign of allergies or long-term health issues. 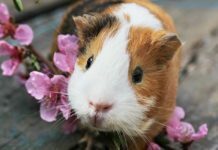 Overall, if the guinea pig is healthy and active, you should have a wonderful friend for years to come. National Research Council Subcommittee on Laboratory Animal Nutrition. (1995). Nutrient Requirements of Laboratory Animals: Fourth Revised Edition. Stahl, P. (2003). Pre-Columbian Andean animal domesticates at the edge of empire. World Archaeology, 34(3). Previous articleDwarf Hamster Lifespan – How Long Will Your Dwarf Hamster Live? Next articleBearded Dragon Bath Time – Do Bearded Dragons Need Baths?